On a few occasions, I’ve been a spectator of Jamaica’s carnival road parade, but never gave much thought into joining before last year. After having the idea of going instilled into me by 2 friends who were no longer able to attend, I still wanted to “do mas”. Looking at the associated costs of jumping in the parade, it’s an understatement that I was SHOOKETH! Buying a 1-day package upwards of $100USD wasn’t a part of the not-yet-existent plan. With jump day nearing, options were running short. 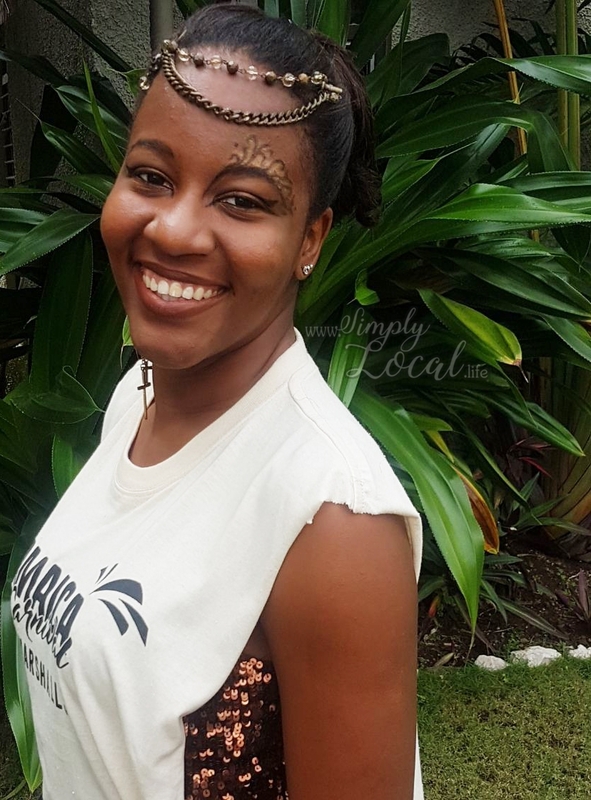 The opportunity arose to volunteer for the pioneers of local carnival, Jamaica Carnival, with less than a week to go… guess who jumped on?! Aware of restrictions of working while chipping dung the road, any bit of parade work seemed way better than being home hearing the party trucks in the distance. With restrictions of where patrons can join the parade, and having to consider acquiring food & beverages along the way, being a spectator didn’t seem like the ideal option to fulljoy the experience. Jamaica Carnival’s band started chippin’ from Hope Botanical Gardens at 12pm, marching along the usually-busy Hope Road. With top-notch djs such as Supahype, Kurt Riley, Jumo, and Dj Spice, plus performances by Beenie Man, Alison Hinds, Bunji Garlin, Faye-Ann Lyons, and Iwer George, the vibes never stalled! My role as a marshall mostly involved holding a rope bordering the truck, monitoring persons on the inside of said rope to ensure safety. This required wearing an identifying t-shirt, but that didn’t mean I had to look and feel plain! With simple make up, a few eye-catching accessories, and a dash of fun outfit elements, I was dressed for work in the spirit of a festive occasion. The role in no way meant that one couldn’t enjoy the carnival experience. I shamelessly sang along with every tune while moving to the energizing beats. Everyone was provided at frequent intervals with water and spiked fruit juices as we danced in the afternoon sun. Travel Tip: If on a budget, t-shirt packages are offered for all carnival bands. It includes all benefits minus the costume; wear whatever you want! Dancing in the streets made for one great party throughout the corporate area. The designated lunch stop near the Hope Road – Waterloo intersection was reached at 4pm. That’s roughly 4 hours to “walk” 5 km, just to give you an idea of the partying with each step. Marshalls, like revellers, are provided with a lunch meal and a short break. After maybe 30 minutes, marshalls had to regain positions around the trucks to anticipate the continuing party. Marching along Waterloo Road, turning onto South Avenue then Constant Spring Road, we jammed up until 8pm. The parade ends with a huge street dance engulfing the Half Way Tree town centre. Popular soca and dancehall music plays, infecting the massive crowd with newfound energy to show off all their moves. The experience is one you’d have to have first-hand to fully appreciate; photos and stories don’t capture just how grand the occasion is. I would love to do road march again, whether as a reveler or a marshall. Carnival in Jamaica started in 1990, when a group of revelers couldn’t make their usual trip to Trinidad for the festivities and decided to bring it home. This movement was started by the late music pioneer Byron Lee, and has since grown exponentially, with this year’s Kingston road parade including a record 4 bands: Jamaica Carnival, Bacchanal Jamaica, Xaymaca International, and Xodus Carnival. This is Jamaica Carnival’s second year #BackPonDiRoad after a 8-year hiatus following Mr. Lee’s death in 2008. P.S. I was so surprised my amateur makeup endured the SWEAT throughout the day! Have you ever played mas? Thank you 🙂 Though I would love to be decked in costume & have the full experience, it definitely wasn’t in the budget this year. So primer and setting spray actually works lool good read jj! ?? Another insightful way to enjoy carnival! Love that you still found a way to participate! Next year, come revel with us! Yes, I had second thoughts thinking I’d be more restricted than I was but I knew had I not gone I’d regret it as soon as I heard the music. Hopefully I can next time 😀 Thanks for visiting. Thank you 🙂 So did I! Only down side is I didn’t take nearly as many photos/videos as I usually would’ve had I not been working. Another time for sure.